Paumanok Tours was started out of a love of Long Island and a passion for kayaking. Every one of our guides is a local Long Islander, with a life-long affinity for paddling here. Both friendly and knowledgeable, our staff is guaranteed to make your time with us safe and enjoyable and to keep you coming back for more. Kevin is the owner of Paumanok Tours and also its main guide. A native of Long Island, Kevin has been paddling its waters for over 15 years. 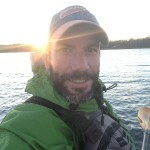 He is an author of two kayaking guideboooks, is certified in American Red Cross First Aid and CPR, is an ACA-Certified Level-II kayak instructor, and teaches high school biology whenever he is not on the water. How did “Paumanok Tours” get its name? Well, Kevin would love to take credit for coming up with it. But the truth is “Paumanok” was the original Native American name for Long Island. Walt Whitman also used the name “Paumanok” to describe his beloved island in the well-known poem “Fish-Shaped Paumanok.” So, when tasked with coming up with a name for a tour company that would celebrate Long Island and its waters, Kevin came up with “Paumanok Tours” as a tribute of sorts to the island’s early inhabitants, Walt Whitman, and all who call it home. Well-begotten, and rais’d by a perfect mother. The work of the fishermen, the work of the eel-fisher and clam-fisher. O the sweetness of the fifth-month morning upon the water as I row just before sunrise toward the buoys.